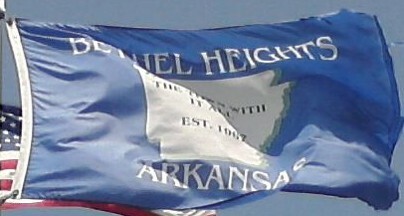 A blue flag with a map of Arkansas in white, the name and state written above and below, and the slogan on the map. From what I can see, there is a star at the location of the town (bottom of Benton Co) and the state map says "The Town with it all." 1967 was the establishing of the city.